City officials plan to explore housing migrants seeking asylum at a shuttered juvenile facility in Alpine, and county officials will explore options next week. An especially chaotic holiday season highlighted the need for more resources, shelter space and coordination to serve the thousands of asylum-seeking families federal officials are releasing in San Diego. After waiting a month and seven days in Tijuana to seek asylum on the other side of the border, Leonardo Garcia and his family ended up outside a San Ysidro McDonald’s after dark. The family’s number had been called five days earlier. They could finally request asylum. What followed was days in a cold holding cell with 27 other men. Garcia’s wife, who is seven months pregnant, and his 10- and 5-year-old children, were held separately. Customs and Border Protection released the family from the federal building at the San Ysidro port of entry, across the street from the nearby trolley, on Dec. 23. Garcia recalls agents ordering them to keep walking, to not look back. They had to get off federal property. It was about 8:30 p.m.
“We didn’t even know where we were,” Garcia said. The family spent that night outside the McDonald’s on the other side of the trolley tracks. Help didn’t come until 4 a.m. on Christmas Eve. Garcia and his family, who had already fled Guerrero, one of Mexico’s most violent states, are among the hundreds of migrants caught in a chaotic nightly shuffle between nonprofit agencies, advocates and volunteers aiming to come to their aid. An especially chaotic holiday season highlighted the need for more resources, shelter space and coordination to serve the thousands of asylum-seeking families federal officials are releasing in San Diego. The Rapid Response Network shelter, coordinated by a coalition of nonprofits and mostly run by volunteers, scrambled at times to respond during the holidays with fewer volunteers. Meanwhile, advocates and politicians continued to call for more help and a more permanent shelter location than the one the Rapid Response Network will be forced to abandon early next month. The network doesn’t want to disclose the shelter location because of various threats of protests and other risks the asylum-seekers may face. The city is now offering potential solution: Camp Barrett, a shuttered county juvenile detention center in Alpine that’s owned by the city. Ashley Bailey, a spokeswoman for Mayor Kevin Faulconer, said the city planned to send a letter to state officials early Friday suggesting state and regional leaders take a closer look at the facility, which has previously accommodated up to 156 youths. Many logistics and other details – including when the facility could welcome migrants or who might operate it – are yet to be determined. Bailey said Faulconer signed off on the offering late Thursday and that the city still must confer with stakeholders. County supervisors, at the request of Supervisor Greg Cox and Supervisor-elect Nathan Fletcher, are also set to vote next Tuesday on several recommendations related to the migrant shelter issues, including whether to direct county officials to seek out county properties that could temporarily house asylum-seekers. In late December, the county also began deploying nurses and county health contractors to support shelter workers during busy afternoon and evening shifts on a daily basis. 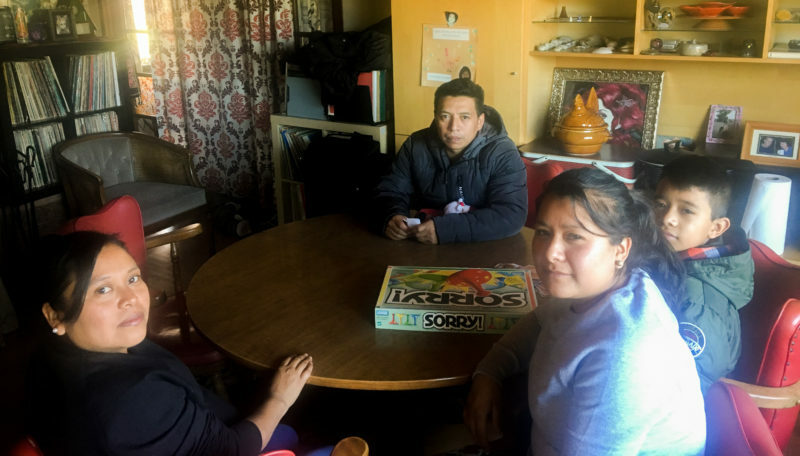 Local agencies’ rush to respond follows an abrupt change in the Department of Homeland Security’s longtime practice of ensuring asylum-seeking families with sponsors elsewhere in the United States had arrangements to connect with them. Federal officials halted that practice amid an uptick in asylum-seeking families, saying they no longer have the capacity to conduct those reviews. Since late October, border officials have simply released families into San Diego, whether they have resources or not. Federal authorities take many families to the nonprofit-run shelter, but the number of families in each drop-off is wildly inconsistent, sometimes leaving advocates scrambling to find space. Other families, like Garcia’s, aren’t dropped off at the shelter, adding to the confusion for advocates and nonprofits trying to help. Sometimes these families connect with the Rapid Response Network. Other times, other advocates must step in. The uncertainty each day complicates things. Two days after Christmas, Immigration and Customs Enforcement dropped off 180 people at the Rapid Response shelter, the most since the releases began. One average, roughly 20 families – or about 60 people – were dropped off daily. Of the 180 people, shelter volunteers and workers were able to coordinate same-day transportation for 21 people whose families lived within driving distance, and house the remainder in the shelter and at a second overflow location, according to a Facebook post from the Rapid Response Network. The Friday before Christmas, roughly 40 asylum-seekers were brought in from El Centro when the shelter was full, and a church had to be converted into a second overflow shelter at the last minute. Families like Garcia’s are grappling with their futures amid that confusion. The night Garcia and his family were released, they waited outside the McDonald’s until 4 a.m. on Christmas Eve. The adults – Garcia, his pregnant wife, sister-in-law and other parents who had been released – stayed awake to ensure their children and belongings weren’t stolen. The family eventually managed to get in contact with local advocate Mark Lane, who they remembered from his visits to their shelter in Tijuana, where he brings donations. Mohamed Elnakib, who works with Lane on these issues, came down to get the families and brought them to a hotel. On Friday, Garcia’s family flew to Pennsylvania, where they have relatives. On Sunday evening, more people were released in San Ysidro, left waiting in front of the McDonald’s. The Rapid Response Network is dependent on volunteers. It made the holidays tough, as many volunteers took time off, reinforcing the need for more permanent staffing for a migrant shelter. That night, a Sunday during a holiday weekend, the Rapid Response Network wasn’t able to find a driver available to come immediately. The asylum-seekers had to wait for a driver who was dropping off other families at a Greyhound station to finish and come and get them. They weren’t picked up until after 9 p.m., roughly four hours later. Lane said he’s helped roughly 78 people since late October. The Rapid Response Network shelter has helped more than 4,000 since the releases began. The struggles don’t stop at the shelter door. Politicians and other leaders fear a potential health crisis. Many families with young children who have traveled for months with inadequate shelter and nutrition, leaving them vulnerable to illnesses. So far, the county has seen one case of hepatitis A, a case of tuberculosis and at least eight cases of chicken pox among the arriving migrants. Scabies, lice, respiratory issues and dehydration are also common. The night 180 people were dropped off, three people had to be brought to a hospital: a two-month-old in respiratory distress, a woman with bronchitis and a person with a leg injury. Medical staff from the county and UC San Diego recently began helping to medically screen migrants but cases can still fall through the cracks amid the chaos. For example, last week, activist Loxie Gant took in a family from the shelter temporarily before they could head to their sponsor in Texas. The shelter had contacted Lane to help house the family, who turned to Gant for help. Gant discovered that one of the children had chicken pox. She ended up rescheduling the family’s flight until they were cleared by public health officials and putting the family up in a hotel. She and her family had to get chicken pox booster shots. The child had also come in contact with Garcia’s wife, who was pregnant, and a girl with cerebral palsy, among other migrants, who all had to see doctors after being exposed to the virus. Jewish Family Service CEO Michael Hopkins, whose agency is one of the San Diego Rapid Response Network partners, said in a statement that the group vetted every step taken with the child after the incident. Sweeney said that county epidemiology officials have been in touch with Lane and the shelter about the chicken pox incident and ensured appropriate actions have been taken, including identification of anyone potentially exposed to the virus, recommending post-exposure prophylaxis as needed and ensuring isolation when necessary to prevent any further exposures. When people are first screened and found to have communicable diseases, they are isolated and not allowed to enter the shelter, Sweeney said. But “the nature of some diseases is that they may not have onset until after individuals are in the shelter,” in which case people then see a mobile medical unit or are taken to emergency care. The nonprofits are now on their fifth shelter location in just over two months. The permit at the current location was set to expire on Jan. 3 but has been extended for one month. Following word last month that the National City armory local officials had hoped to use as a shelter is unavailable, San Diego officials still hope the state and incoming Gov. Gavin Newsom will help. Now the city is also stepping up to offer the city-owned facility in Alpine that’s more than 45 minutes from the border. County officials have previously said Camp Barrett could accommodate up to 156 people. The Rapid Response Shelter Network can now take in up to 134 people but Chávez-Peterson previously told Voice of San Diego an ideal permanent location could sustain around 250 people on any given night for at least a year, given the constant uncertainty of the number of migrants needing shelter. The county proposal from Fletcher and Cox could also bring more options to advocates. But it’s not clear whether other supervisors will support their request to search for county and other state properties to shelter migrants – or what properties the county may be able to quickly offer up on its own. Last year, Cox was the only supervisor to vote against the board’s decision to file a court brief supporting the federal government’s lawsuit against California’s sanctuary law. County supervisors have also previously given county staffers the go-ahead to assess whether excess county properties could be used for affordable housing projects. Fletcher and Cox both stressed the importance of averting a potential public health crisis in the wake of a deadly hepatitis A outbreak in which county officials have been admonished for not responding urgently enough. “Our main priority is to prevent any public health issues that may arise out of this crisis and make sure these families and children are getting medical screenings,” said Cox, a Republican who represents South Bay communities. Fletcher said he also wants to ensure asylum-seekers aren’t forced onto the streets or into already overburdened homeless shelters. Cox and Fletcher’s joint proposal follows their holiday visit to the existing migrant shelter. Both said that government agencies, including the county, need to do more to aid the nonprofits operating the shelter. Will Huntsberry contributed to this report.